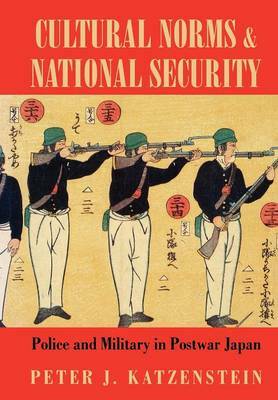 Nonviolent state behavior in Japan, this book argues, results from the distinctive breadth with which the Japanese define security policy, making it inseparable from the quest for social stability through economic growth. While much of the literature on contemporary Japan has resisted emphasis on cultural uniqueness, Peter J. Katzenstein seeks to explain particular aspects of Japan's security policy in terms of legal and social norms that are collective, institutionalized, and sometimes the source of intense political conflict and change. Culture, thus specified, is amenable to empirical analysis, suggesting comparisons across policy domains and with other countries. Katzenstein focuses on the traditional core agencies of law enforcement and national defense. The police and the military in postwar Japan are, he finds, reluctant to deploy physical violence to enforce state security. Police agents rarely use repression against domestic opponents of the state, and the Japanese public continues to support, by large majorities, constitutional limits on overseas deployment of the military. Katzenstein traces the relationship between the United States and Japan since 1945 and then compares Japan with postwar Germany. He concludes by suggesting that while we may think of Japan's security policy as highly unusual, it is the definition of security used in the United States that is, in international terms, exceptional. "We find in this work insightful and interesting accounts of Japan's police and military, including historical background, present problems, and future prospects.... Katzenstein provides well-balanced, up-to-date descriptions on this complex subject." "An important study that deserves careful attention not only from Japan experts, but from all East Asian security analysts, as well as scholars interested in the forces that drive security-policymaking in general." "Katzenstein offers one of the most interesting approaches in many years to analysis and interpretation of national security policy and behavior." "Katzenstein wishes... to explore the relationship between culture and national security, using Japan as a case in point. He contends that, since World War II, Japan has developed a distinctive, comprehensive, and generally nonviolent definition of security that is different from that of the United States. To make his argument he follows a discussion of Japanese cultural norms with chapters on the police and the Japanese Self-Defense Forces, before exploring the U.S.-Japanese relationship and drawing an extended comparison between Japan and Germany.... An intriguing work well worth reading."